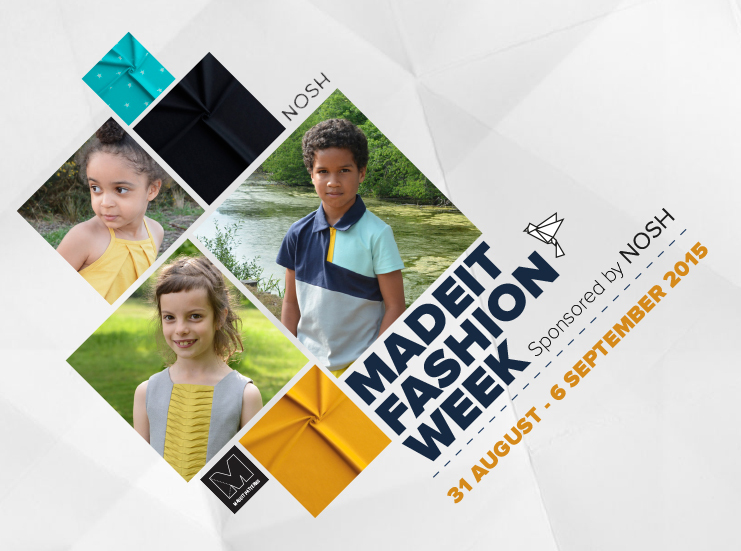 It`s Madeit Fashion Week! 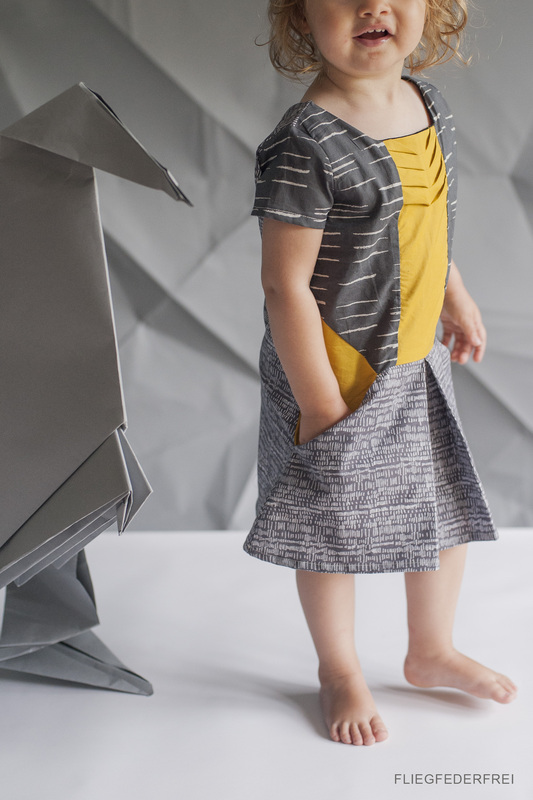 I couldn`t be more excited about Anna and Olu`s new Patterncollection! It`s just stunning! 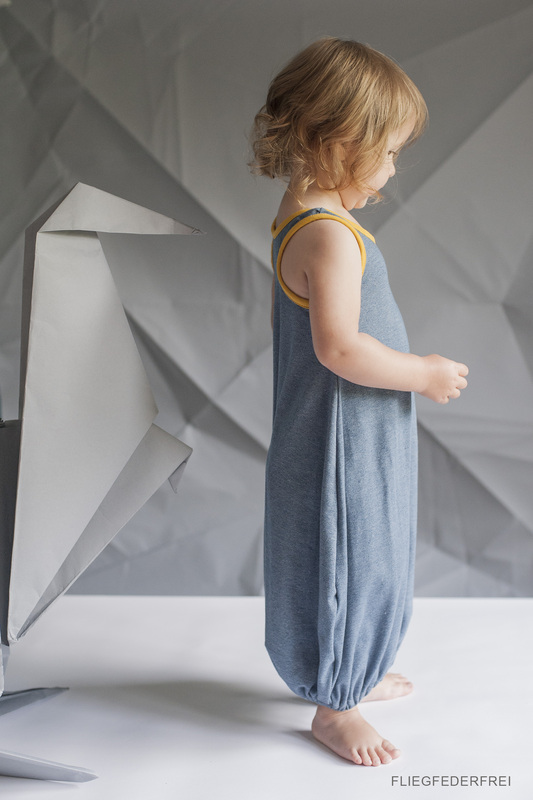 Those two ladies made kids fashion in a very pure and beautiful way. Clever patterns with clear lines. There is no pink there is no candy, it`s made for real kids. They offer a few pattern for boys, but they`re actually suitable for girls as well. 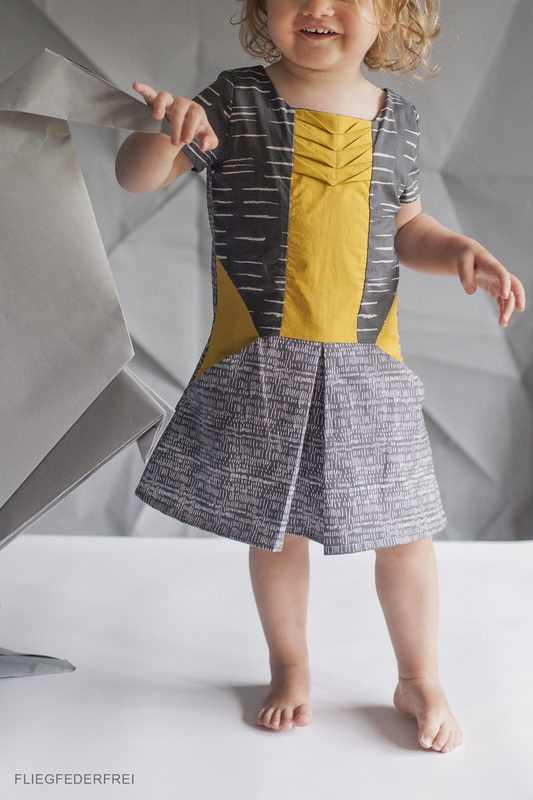 I picked two patterns out of the Fold2 collection and sewed tree garments. It was a lot of fun and i`m sure,there will be more Madeit sewing in the next weeks. The instructions are clear and you can see that the graphic is made by a pro! 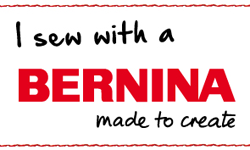 It`s easy and straight forward to work with. And Olu`s humor is shinning through from time to time, what made me smile while sewing. The skirt is self-drafted, it`s a simple rectangle gathered with an elastic. Fabric found at a market in Italy it`s golden linen. Pretty fancy! Fabric of the top, bodice-side bought at Anna Ka Bazaar in Paris. Bodice-front is from Cotton and Steel bought at Petite Couture. I can remember sitting in the metro in Paris, while the Paris sew social weekend, back in April. When Olu showed a preview of the Petal Fold Playsuit. I was blown away and since this day, I was waiting for this pattern! 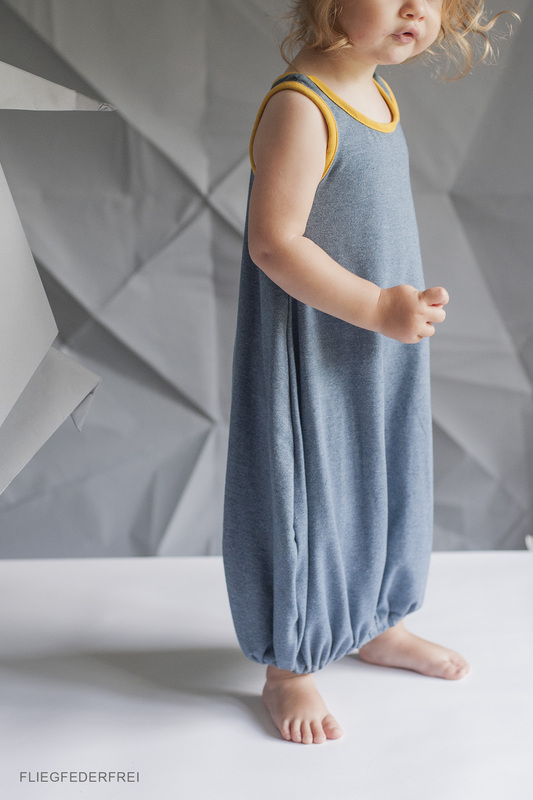 As playsuits with back opening isn`t something very practical for a two-year old diaper carrier, I was delighted to find out that there is a supplement with the separates. And because I loved the look of the playsuit I made her a dress inspired by it. The balloon fold dress, which can be worn 3 ways, was my second choice. I just had to try it. It seemed to be genius! And I can tell you it really is. Such a great fit and such a fun and comfy dress. My little bean wore it the whole day after I tried it on. And that`s something really special at the moment! She take it up and down just as she feels like. Fabric is from a local store. It`s a very lightweight t-shirt knit. 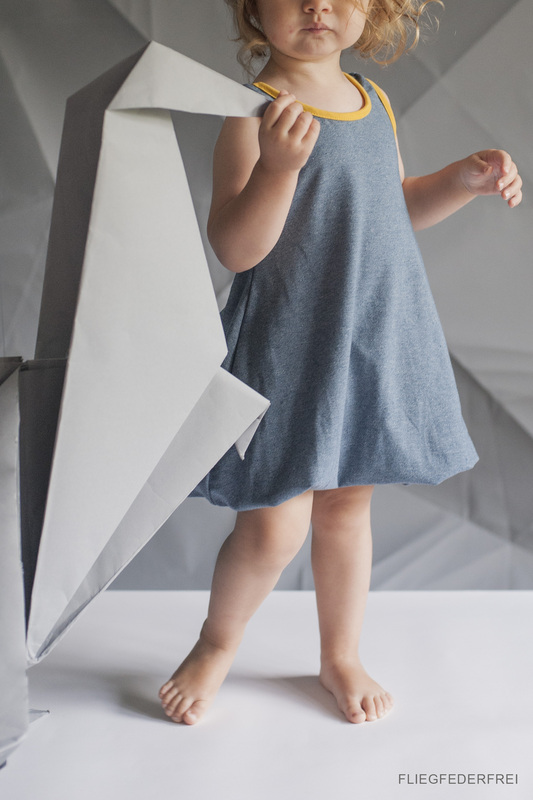 It was a little extra challenge to incorporate some Origami into our blog posts. So what do you think about my big dinosaur? By the way all the honor goes to my `husband` who took his time, yesterday evening folding it, while I was working. I love you! Madeit is offering 20% off during the Fashion Week, take your change! all you have to do is correctly answer a question related to the Fashion Show that Olu of Needle and Ted will post on Facebook or Instagram at random times of the day. The first person who correctly answers the question will win a pattern of their choice from the FOLD Collection. All you have to do is leave a comment on Needle and Ted on day 7 of Fashion Week (Sunday 6 September) letting Olu know what the highlights of the Fashion Shows were for you. She will pick a winner from the comments and the winner will be notified by email the following week. And there is another giveaway on Instagram to win the other €50 Nosh voucher. Look out for the prompt. Congratulations to Anna and Olu, you really know your business! Thank you for having me. Yay for helpful husbands on the backstage! Love all the looks, they go together so well! he really is the best. he just did it as a surprise knowing that i’ll run out of time! I absolutely knew that you would make something special but OH MY!!! you have surpassed all my expectations. I really don’t know what to say, you have left me speechless. that’s exactly what happend to me when i first saw the fold 2 collection! Your fashion show is so lovely! 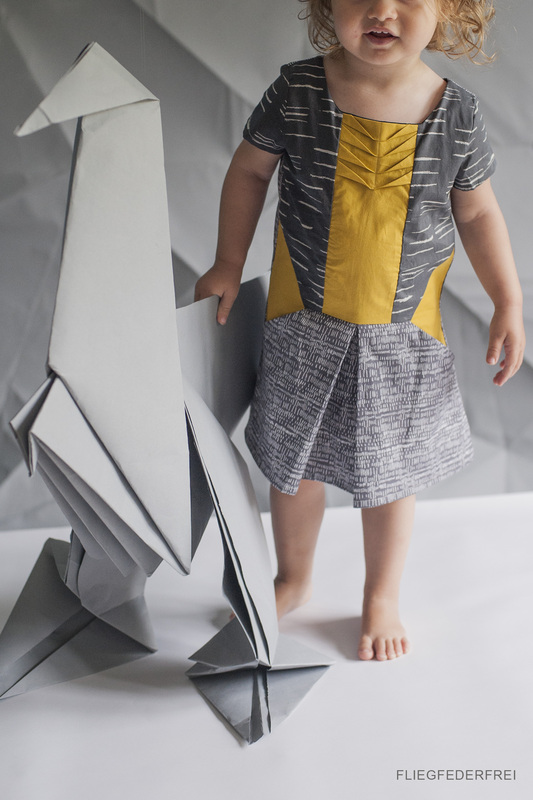 I like the fabric combinations and the big origami sculpture!!! such a great idea. thank you! i just did some stash sewing! I love all of your outfits but OMG that dress you made from the Petal Fold playsuit is something else, WOW! and what a fabulous husband!! thank you anna, can’t wait until she’s big enough so i can sew her a ‘real’ petal fold playsuit! congratulations for your work! thank you! the origami was made by my husband as a surprise! I love all of your outfits! 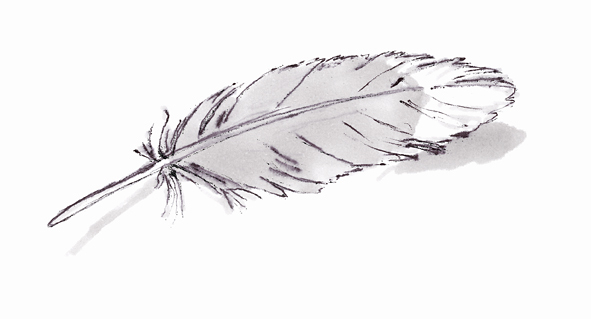 You always make such beautiful things. 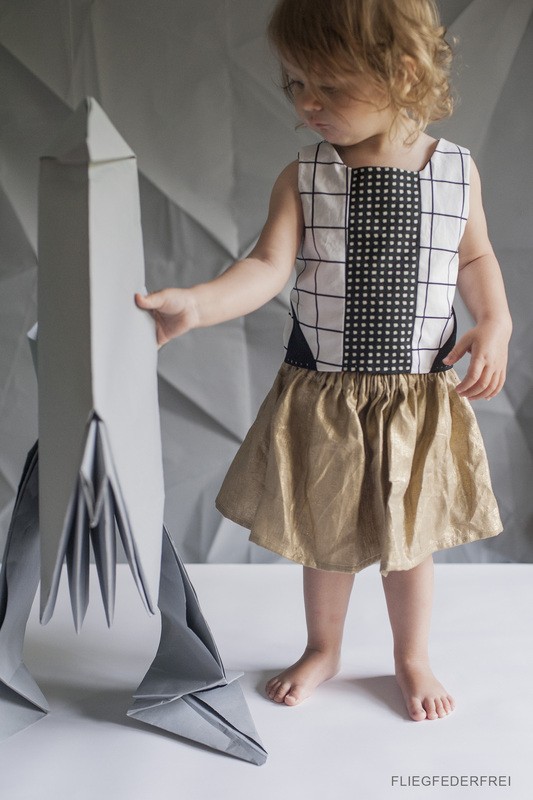 And the dress you made using the playsuit — perfection!!! 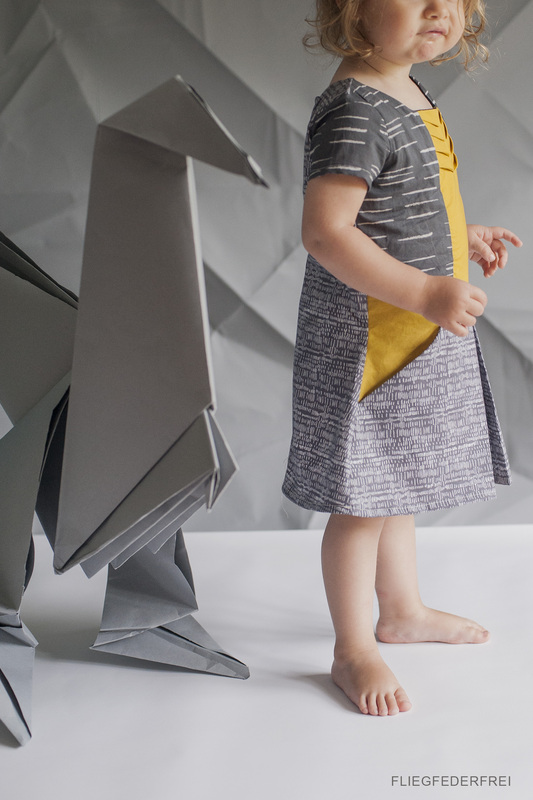 Love all your fabric choices, your giant dinosaur (where did you get paper that big?) and your clever idea to turn the playsuit into a dress. 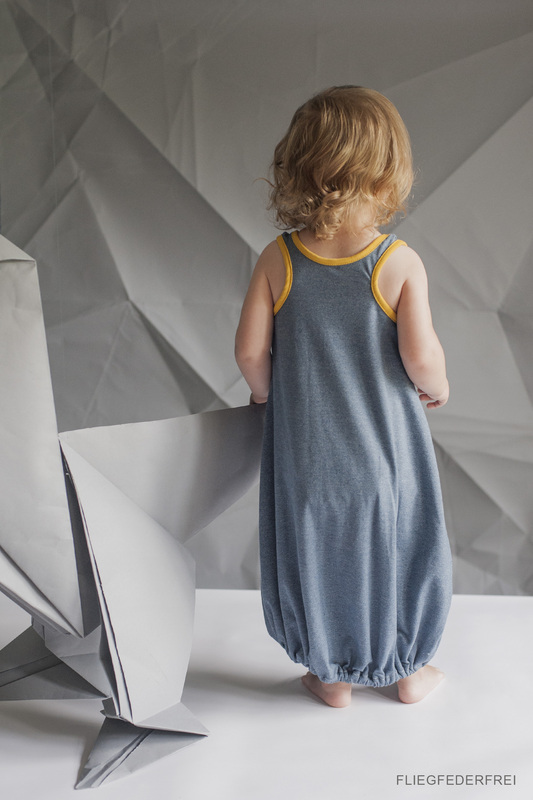 I didn’t make one for my little one as it’s not that practical for a recently toliet trained two yr old either, but the dress is a great idea. it’s background paper for photoshootings. it comes in rolls 4m wide. but it was to heavy to stand on his own. it hangs from the ceiling with an invisible string. thank you. 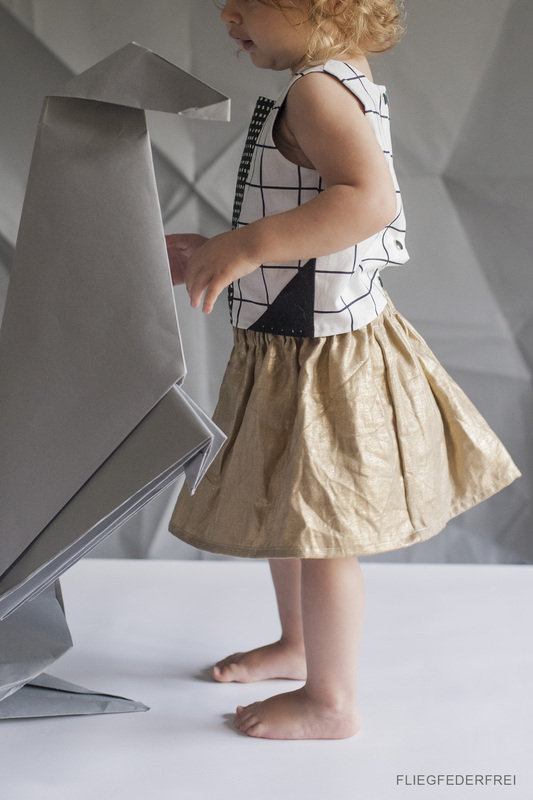 i think my girls vote goes to the baloon fold dress! This turned out super beautiful. Love how you incorporated the Atellier Brunette fabric. And thumbs for your origami-making husband! Love it, really very beautiful!